We have been looking at the Day of the Lord in the last few posts. We've seen that the Bible plainly excludes the Tribulation from the Day of the Lord simply because the Day of the Lord FOLLOWS the Tribulation. Let's look deeper at the Day of the Lord. Zechariah 14:7 indicates that the day of the Lord is one literal 24 hour day! This is the literal meaning of the text. The day of the Lord is not 1,000 years long (or 1,007 years long for that matter). It is a single 24 hour long day that has an “evening” and a morning. It is the day when the Lord Jesus returns and makes an end of all his enemies (v. 3 -9). Sometimes, “that day” refers to the Tribulation, and sometimes to the Millennium, and sometimes to the day of the Lord. All the passages that specifically mention “the day of the Lord” are compatible with a single 24 hour day. Now, we're going to look at something here that is very important. Stick with me, and we'll get back to the Day of the Lord in a little bit. They would say, for example, that the “gospel of the kingdom” (Matt. 4:23) is not the same as the “gospel of the grace of God” (Acts 20:24). And the “everlasting gospel” of Revelation 14:6 is something else altogether. The Gospel that Jesus preached during his earthly ministry, he called "the gospel of the kingdom." The hyper-dispensationalist (aka, the cessationist) will say that the reason Jesus had SIGNS and WONDERS associated with his ministry was because he was preaching the good news of his Kingdom, and showing forth the evidence of it. We don't preach the same gospel today...or so they say! The gospel that we are currently taking to the ends of the earth is THIS GOSPEL! It is the same gospel taught by the Lord Jesus to Peter, and revealed by the Lord Jesus to Paul. Paul’s testimony in this verse destroys the arguments of the hyper-dispensationalist and the Mid-Acts dispensationalist. The very last verse of the book of Acts has Paul still preaching the same gospel that Jesus preached! The gospel of Jesus is the gospel of the kingdom. It is the gospel of the grace of God which was preached by Paul. It is also the everlasting gospel announced by the angel in the Tribulation. The Lord reveals different ASPECTS of the same thing through the use of different words and phrases. Comforter, Holy Ghost, Holy Spirit, Spirit of Truth, Spirit of Christ, Spirit of the Father, Spirit of adoption, the eternal Spirit. These words/phrases are ALL different. Does that mean that they are each referring to a different ‘Spirit?’ (If we follow the hermeneutic of the hyper-dispensationalist they do!) Or do they each refer to a different ASPECT of the same Spirit? Doesn’t each term reveal to us a little more about the Holy Spirit? Listen, what hyper-dispensationalism does to the gospel, the pre-tribulation Rapture does to the day of the Lord! Did you see what he just did? He separated the day of Christ from the day of the Lord! But is that proper Biblical exposition? Is Jesus Christ the Lord or not? Is He God come in the flesh or not? If He is, why can't the day of the Christ be equivalent to the day of the Lord? Whose feet stand upon the mount of Olives? Aren't they the feet of the Lord Jesus Christ? So, why can't the day of the LORD equal the day of Christ? In the Old Testament, rewards were associated with the coming of the Lord GOD. But, in the New Testament, they are associated with the coming of the Son of man. It is at the glorious second coming (the day of the Lord) that Christ brings his rewards (the day of Christ). Listen! The Day of Christ IS the Day of the Lord. And, the Day of the Lord IS the Day of Christ. 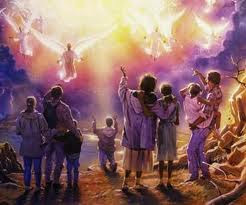 And that means that the Rapture, which occurs on the Day of Christ, occurs on the Day of the Lord. We have previously shown that the Day of the Lord is AFTER the Tribulation. This means that the RAPTURE is also AFTER the Tribulation. Indeed, the Rapture is AT the Revelation. Which is what we've been saying all along! (Well, this post is getting pretty lengthy, so I'll stop here. Hopefully, it's given you something to think about. The pre-Tribulation Rapture doctrine is such a confused mess, that I feel as if I'm having to untangle it one strand at a time. Finally! Someone else in Columbus, Ohio who gets it.